Shopping for Christmas presents is a year-round event in our house. 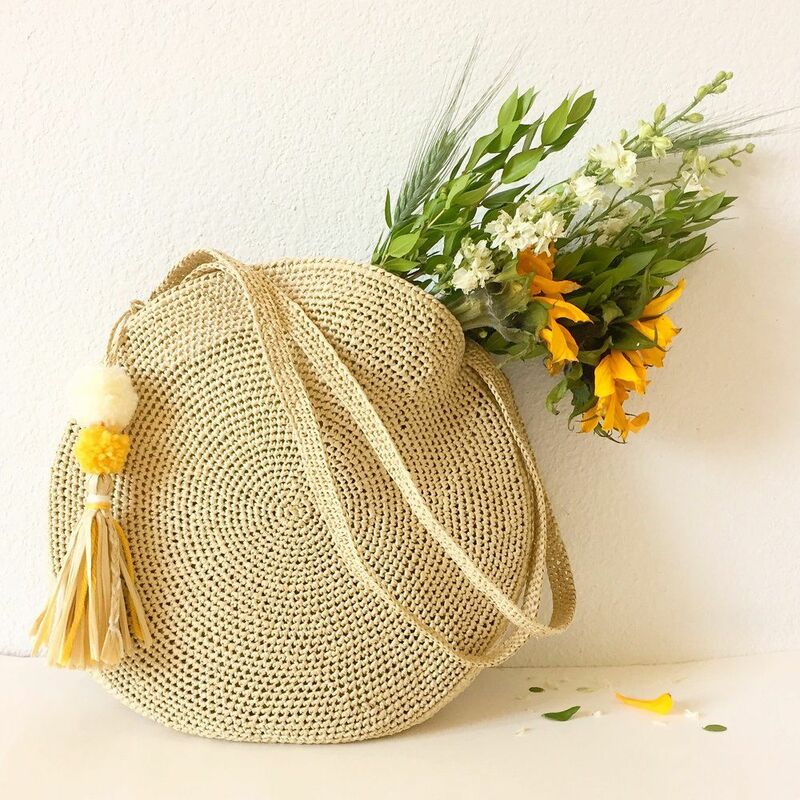 Where ever our journeys take us, we are always on the lookout for some special little something to remember the town, place or just a nice day. Problem is, Mom’s birthday is in November which usually means the Christmas stash often takes a big hit. Add to that a number of situations which kept us home the past two months and needless to say the Christmas gifts for Mom pile is a bit thin this year. I always sew or crochet something for her anyway, but this year I opted to let her pick. Sure, Mom, hit Pinterest, search for what you might like and I’ll see what I can do. She hit upon stuffed felt cats and picked out one she liked. Oh, boy, a turned piece and one with a tail that looks darn near impossible. Sure, Mom, I can make that. A whole day later and it’s about 85% done. So, this Christmas Eve was like most of them in year’s past – sew, sew, sew. So, what did she pick? 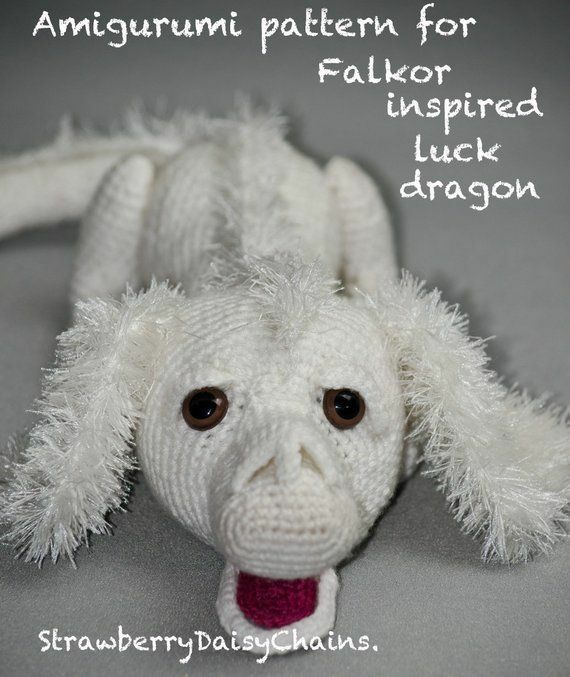 It’s a charming piece from one of the talented designers on DollmakersJourney.com. 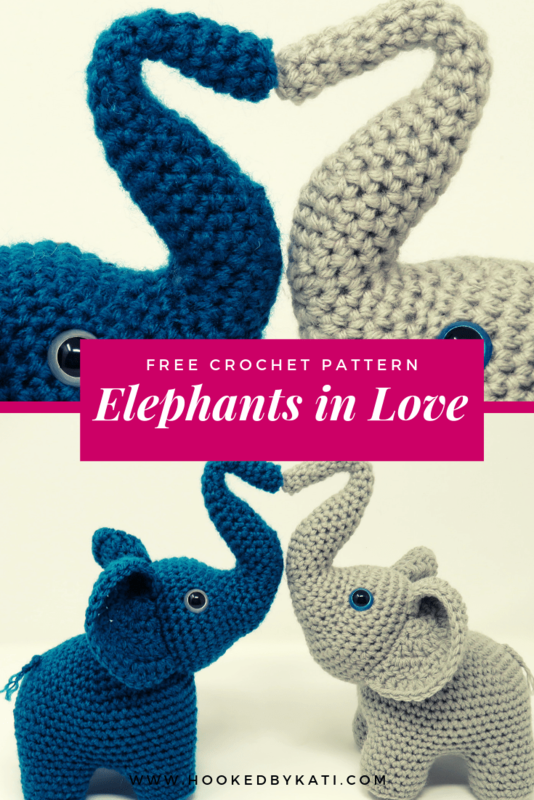 It’s a place where professional doll makers gather and sometimes offer wonderful free patterns amongst the many patterns and instructional CDs offered for sale. 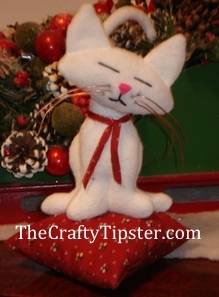 The sassy kitty pincushion that mom picked out was designed by Sue Daniel in 2011. Here’s what her’s looks like. 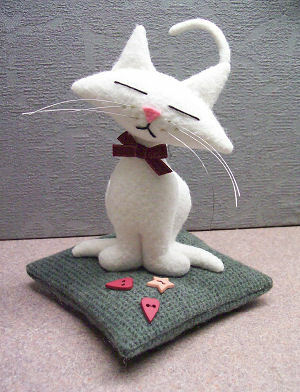 Sue provided several versions of her felt stuffed cat for inspiration. Mom asked for basic white. As luck would have it, the only nice white felt I had was thick and somewhat stiff. 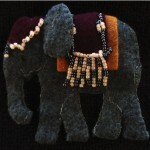 The biggest issue was that all of the pieces were sewn and turned. 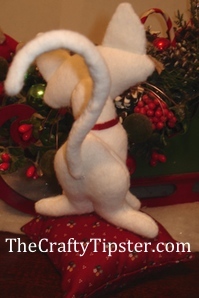 Much more fussy sewing that using a simple blanket stitch like so many of the other stuffed felt patterns use. Lesson Learned #2 – Even if the pattern instructions recommends folding the fabric and cutting two pieces at once, sometimes it’s better to place and cut each piece separately – particularly if you only have one sheet of the felt you are using. Lesson Learned #3 – When you don’t have nice tools for turning fabric, don’t waste your time trying to make something from felt that is only as big around as a pipe cleaner and needs turning. Mid-way through turning, I poked a hole in my first tail. Though fiddly, I ended up making my tail using a ladder stitch. Great results, tough on the hands. The one alteration to her instructions I did make was adding some weighted stuffing beads to the pillow. The pillow is so much lighter than the cat that it easily tipped over. By adding some weight, in the form of plastic poly-pellets, the piece stands nicely and more securely. Just put about half of the poly-fil in place and then carefully pour some pellets between the fluff and the fabric. I love the heft these things adds to small projects but if your stitches aren’t nice and tight, the pellets can sneak out. I used copper wire for my whiskers. I think they are a little dark and thick compared to Sue’s original kitty. But, Mom picked out the wire and loves the extra bit of contrast from the darker wire. The biggest lesson of the day…be very careful before you let someone visit Pinterest and pick out whatever project strikes their fancy. You may end up with something cute but if there’s a deadline involved you just might not meet it. Luckily for me, I’ve made several stuffed felt projects and was able to have my Mom’s cat under the Christmas Tree on Christmas morning. I think my cat turned out great. Even better, Mom loves it. 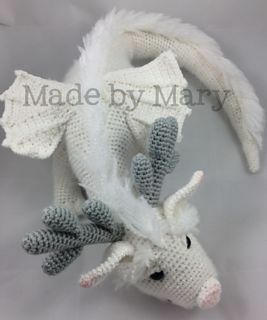 Thank you Sue for making this great pattern available to everyone. 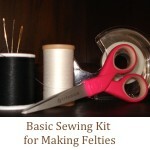 Going to break out your needle and thread and give this felt stuffed cat pattern a go?